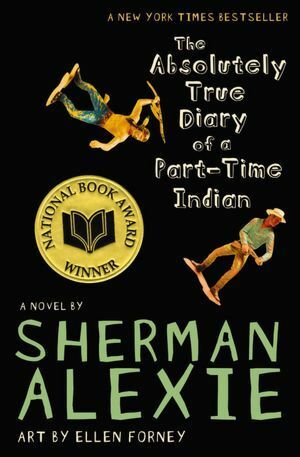 For Banned Book Week, I decided to read The Absolutely True Diary of a Part Time Indian. I have had this book for a while and decided it was TIME to read this book for a ridiculous cause of Banned Books. My only disappointment was in myself for not reading this book sooner. Junior has known nothing outside of the reservation. Generations have lived there in poverty, with no hope for a successful future. However, Junior decides to make a future for himself by going against the tribe, and attend an all white school. Junior has dealt with racism and bullying his whole life. He has tremendous fear attending the first day, but over the year, he earns the respect of his schoolmates, and discovers that all have their own problems to deal with. Junior shows so much courage throughout this whole story. He talks about his pain, his fear, his hopes for wanting a better life for himself, and his tribe. That alone, makes no sense to me why this book has been banned. Is it for the racism in it? Is it for the teenage boy’s honesty? Is it for the alcoholism and domestic abuse? All these things are in the real world people. All these things people deal with on a daily basis. To keep this book banned for the realism is not going to protect anyone. This story made me laugh and cry right along with Junior. The hardships that he has had to face: hunger, death, bullied; how could you not feel this emotion right along with him. The humor definitely made me giggle, and the triumphs made me rejoice along side him. I read this book in a day. I was sorry when it ended. Banned books…where do we live? Banned books…it is an insult to every man and woman that has fought for our freedom. Banned books…it should be a person’s choice, not the decision made for them. Seriously, the reasons they come up to ban book just make laugh! This one banned? They need to review their committee… is it form of ladies born in the 1930s? What a great book to spotlight for Banned Book Week! I agreed with so much about what you said about the story. Junior really did show amazing courage throughout the parts of his life that we see. I think MG/YA readers will continue to fall in love with the book, the characters, and the story. Thanks for sharing!